Sprayer and Drum Pump | Bio Systems, Inc.
BioSystems, Inc. offers a 3 gallon chemical resistant sprayer that is compatible with all of our products. Each sprayer is equipped with a brass flow control, extension and nozzle. The upgraded Viton® seals will not crack, swell or become brittle even after extended use. The industrial grade hose and convenient carry strap make this sprayer a great buy! Chemical resistant and compatible with all of our products. Conveniently screws onto our 16 oz. bottles. Fits 55 gallon drums with 2 inch bung openings. Has zinc die-cast piston with brass piston ring. Includes bung adapter and curved discharge spout. 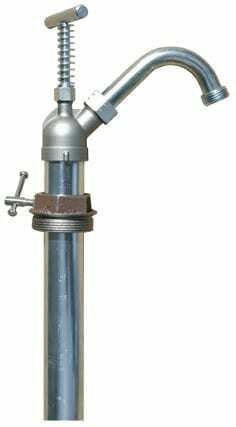 Discharge spout can be rotated 180° and can be removed to expose garden hose threaded outlet. Dispenses approximately 1 1/2 pints per stroke. Compatible with all of our products.